Spots of pink and white are finally decorating the Tidal Basin -- and soon, it'll be all pink as the cherry blossoms will likely reach peak bloom later this week. While many cherry trees are already blooming, others haven't. Even on the same branch, some buds are emerging while others haven't popped yet. 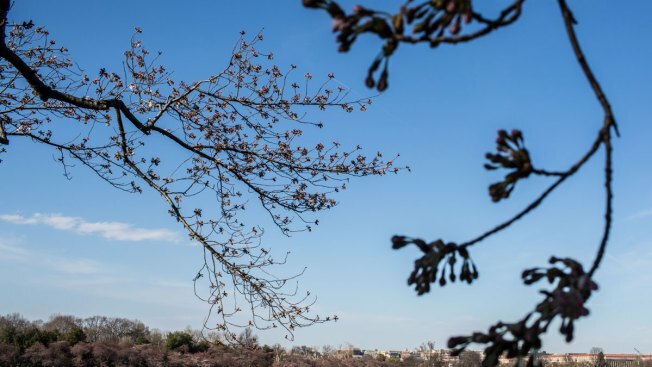 On Tuesday, the National Park Service will be looking at trees to pinpoint exact peak, which is when 70 percent of the Yoshino Cherry treets along the Tidal Basin have bloomed. Right now, the trees are in the NPS calls the puffy white stage. It's the last phase before peak bloom, and means most of the cherry blossoms will be in bloom in 4-6 days, likely this weekend. That's picture perfect timing, just in time for some of the National Cherry Blossom Festival's key events. The National Cherry Blossom Festival Parade and Sakura Matsuri Japanese Street Festival are both set for Saturday, April 12. The parade runs 10 a.m. to noon. Grandstand seating is $20, but it's free to watch while standing along the parade route. The street festival will happen 10:30 a.m. to 6 p.m. Admission $8 for ages 13 and up; kids are free. When the peak bloom forecast was issued several weeks ago, many were skeptical of the blossoms' timing after a long, harsh winter. But this year isn't so far off last year, when peak bloom was pushed back several times and finally occurred April 9 after a chilly spring. "Unfortunately, we are leaving today, but we're happy to have seen this," said tourist Lorraine Johnson on Tuesday. Visitors are satisfied, and despite the wait, photographers are still able to snap the ideal shot. "They look very nice," Langlois said.